On Cherokee Street in the Upper Hill District of Pittsburgh, drugs passed daily between neighbors and visitors. And on Aug. 5, 2008, Frank Johnson got caught in the cycle. By sunset that day, at 34 years old, Johnson’s freedom was no longer guaranteed. Convicted by a jury in October 2010 for charges including delivery of a controlled substance, criminal conspiracy and possession of drug paraphernalia, Johnson spent the minimum sentence in prison: seven and a half years. He spent the first three and a half years in the Pine Grove State Correctional Institute in Indiana, Pennsylvania, before his transfer to Mercer County Jail in Mercer, Pennsylvania, for the next four years. While incarcerated, Johnson frequently visited Mercer County Jail’s library, reading spiritual books written by Pastor Doug Goins and crime novels by James Patterson. Almost three months ago, Johnson stepped out of his cell, gathered his legal mail and pictures of his family and went back into the world. In his first few months of freedom, Johnson chose to spend his time helping others who needed books just like he did. Now through Book ‘Em, Johnson and other volunteers, including some Pitt students, provide inmates with an opportunity Johnson never knew existed. 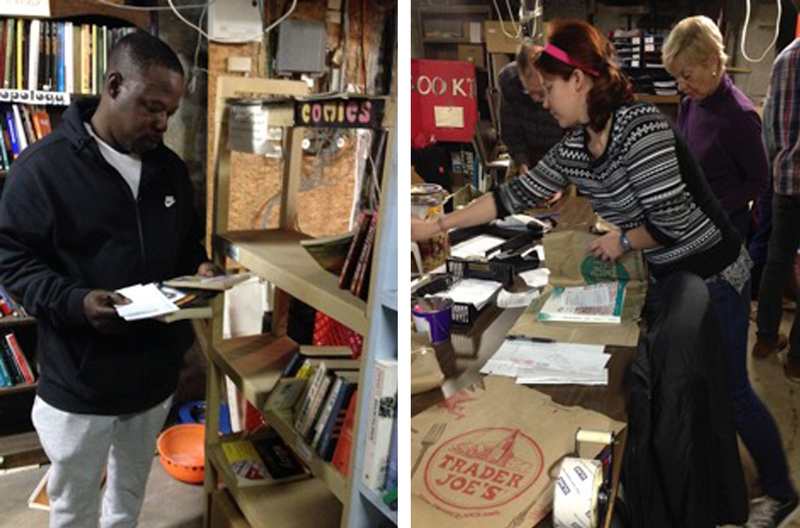 Johnson volunteered in November for the first time at Book ‘Em, a nonprofit sponsored by the Thomas Merton Center, an organization that advocates for peace and social justice. On the first three Sundays of every month, volunteers for Book ‘Em — including Pitt students — receive and fulfill book requests from inmates in Pennsylvania state and federal prisons. Book ‘Em works with the 26 state facilities and six of the nine federal prisons, including those of Lewisburg, McKean, Loretto, Schuylkill, Allenwood and Philadelphia. More than 4,000 inmates are registered in the Book ‘Em database. Book ‘Em volunteers open and read the letters, search high and low in the dusty, crowded basement of the center, wrap the books in grocery bags from Trader Joe’s and sends them to the inmates. According to the National Institute of Corrections, Pennsylvania’s 69 jails have 36,720 inmates and its 25 prisons have 50,694 inmates. Although inmates in jails have shorter sentences than those in prisons, the organization delivers books to both groups. Johnson, who found Book ‘Em through an organization that helps integrate former prisoners back into society, said he spent 45 days in solitary confinement. After talking back to a correctional officer, Johnson spent 1,080 consecutive hours without human contact. All he had were the books in the library. The sentence was originally 60 days, but he got out early for good behavior. Jodi Lincoln, a University of Pittsburgh graduate, heard about the organization through her activist work with the center. Inmates are allowed to send requests for three books once every three months. Books are donated by students, volunteers and libraries. Volunteers meet requests as best they can, but sometimes they cannot be fulfilled due to strict prison rules, according to co-director of Book ‘Em Suzanne Powell. Prisons do not accept books with writing, highlighting or alterations for fear of conspiracy and communication between prisoners and the outside world, she said. Powell said some prisons don’t take hardcover books because they can be used as a weapon. According to Powell, of the 4,310 inmates registered in the Book ‘Em database, most request dictionaries, thrillers, romance novels or coloring pages — although coloring materials aren’t included. Sometimes, though, an unusual request is made. Roger Stoffregen of Edgewood recalls letters asking for books on photojournalism and South American and Australian indigenous populations. “The most disturbing [requests] ask for true crime novels,” Stoffregen, 62, said. But the honest requests don’t deter him, or other volunteers, from returning. “Sometimes it’s so crowded, you can’t even find a place to package the books,” he said. Samik Patel, a junior bioengineering student at the University of Pittsburgh, joined Book ‘Em through the University Honors College five weeks ago and has gone every Sunday since. Patel, who is from King of Prussia, Pennsylvania, said a lot of his friends and friends’ parents were in jail. “You really develop a personal connection to each letter. Someone takes the time to write this and you’re curating what they’re going to read. You’re deciding what they’re going to be thinking about for the next three months,” Patel said. Johnson understands that isolation and missing personal connections firsthand. He missed the birth of his first granddaughter, Justice, because of his decisions. If the past eight years have taught him anything, Johnson said, it’s the importance of doing good. Book ‘Em meets the first three Sundays of every month from 4 to 6 p.m. Pitt students can sign up to volunteer with Book ‘Em through the University Honors College Prison Rights program. They also hold bi-weekly meetings Tuesdays in 235 CL starting on Jan. 10 and can be reached by email at pittprisonoutreach1@gmail.com.